I like this straightforward, yet pleasant message. No apologies, no beating around the bush. How often do we want to say “No” to something, yet we feel awkward saying the words or obligated to answer with something else. We feel as if we must explain. But really… would a simple, pleasant, confident “No” work? I’m thinking maybe it would. We should not feel uncomfortable using it more often. With a smile and with an attitude of respect for the person we are answering. Like this “No Parking” sign, maybe we can make our answer of “no” something beautiful rather than something we would hide in a dark alley. “No Parking.” I am happy to oblige. How about you? This image is from the town of Haworth and it jumped out at me when I was going through my photos the other day. The message was just so clear. So this month I didn’t end up going through all of my September photos for the Photo-Heart Connection. I have them with me on the trip and planned to, but I didn’t need to. This message came to me beautifully gift wrapped with pots and flowers and a birdhouse. A “no” never looked so good. It reminded me that we can make an answer someone might not want to hear in a strong, confident and respectful way. And when we do, it changes everything. What is your Photo-Heart Connection this month? I would love to hear. Bring on those strong, confident messages! Your right, a no never looked so good. 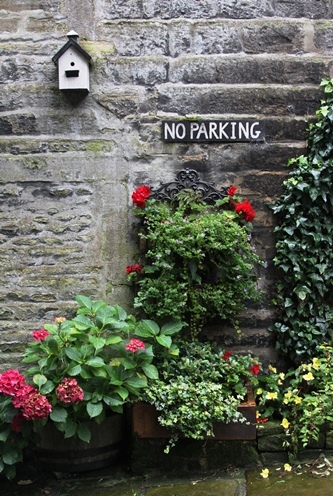 That has to be the most beautiful ‘No Parking’ sign I’ve ever seen. So many of us have a hard time saying “no” but it would certainly help if many of us were able to say it more often. Gorgeous photo! And, yes, so nicely said! Hope you’re having fun in the UK. I love this image, the stone, the sign, the birdhouse, the beautiful flowers. Wouldn’t it be lovely if all the “don’ts” that we encounter every day were as nicely expressed? You’re right, it is often hard to say no. I still struggle with it sometimes, but I’m much better at it than I used to be. And I’ve learned that it’s best to keep it, as you described, simple, pleasant, and straightforward. I find that’s usually better received than waffling, which often leads to an awkward discussion or argument. Love this beautiful photo, love the text on it. No is a powerful word that is deeply relate to boundaries, a word that some of us don´t find easy to say, but we can learn. Wonderful image, I love it. Hi Kat, I was visiting again to check out more connections and realized I hadn’t commented earlier. I love the photo and yes you are so right about a “No” not having to be harsh . . . matter of factly with a little honey can go a long way.